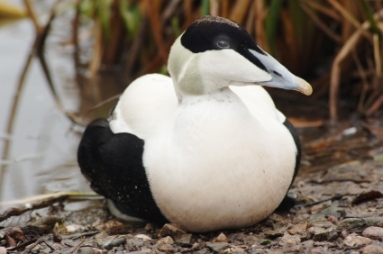 Well the ducks do anyway -- the real Eiderdown manufacturers are the Eider ducks.The common Eiders of North America inhabit Greenland, Iceland and Canada. Sanctuaries have been established in these areas to give the ducks a safe haven to breed and have allowed the species to make a come back from their near disappearance in the early 1900's. No plucking, killing, or pain. The havesting of down and sales of cruelty free Eiderdown comforter and bedding actually helps in sustaining the species. 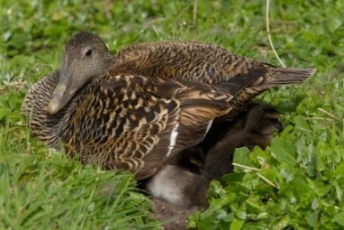 Eider down cluster are unique from all other feather down. Eider down has these little hooks that sorta crochet themselves together. This unique feature is a benefit in two ways. 1. Cold spots are eliminated because all the down hooks together, never leaving you with a bunches here and there. 2. The hooks create a lot of very small pockets of air – the smaller the pockets the warmer the product. So less filling is required for equal warmth. With such luxury comes a hefty price. Be an advised shopper when buying Eiderdown duck bedding. Return from this Eiderdown Manufacturers page to the Down Bedding Delights home page.